ProVia Door - Offering a Lifetime Limited Transferable Warranty! We take pride in delivering storm doors of top quality construction made with the finest materials, ensuring you a product that will last for many years. 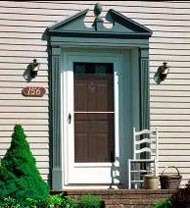 Our storm doors excel in beauty, durability, security and energy efficiency. Our extended aluminum frame adds beauty to our door by virture of the rounded cove molding along the glass edge of the extrusion. All our storm doors are constructed wtih tempered safety glass. Our color matched bottom expander allows for a beautiful custom fit to any entry. The corrosion resistant steel gussets enhance the structural integrity of the door. Our sweep system insures a snug fit and allows for adjustment as needed (varies by model). You'll appreciate the finshed look of the colored matched aluminum nstallation screw covers we include in every storm door package. Each of our doors include quality hardware that adds beauty and functionality to your new storm door (varies by model). A quality door closer is included in every storm door package (varies by model). Our doors arrive non pre-hung unless otherwise specfied, enabling an easy right ro left hinge installation. 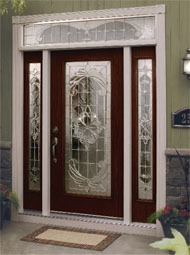 Fiberglass entry doors: better than nature at its best! We provide the genuine look and feel of a wood door – with none of the performance problems that are associated with natural wood products. Plus, fiberglass doors offers four times greater insulation performance than any wood door. Notable difference in details. Doors are available in a variety of extra-deep embossed To add distinctive stylingo this already distinguished doors, designers supported each of them with a wide choice of decorative glasslights with matching sidelight and elegant transoms. Steel entry doors; style and security. Steel doors have been proven to be more secure than traditional wood-edge doors. They are reinforced with lockset area, interlocking steel edge, and hinge reinforcement. These doors are energy efficient and have a true thermal break. Each door comes in a wide variety of colors, bringing style, beauty and reliability to your house. We offer patio doors from, Alliance® and Marvin®. For more information please visit there sections under the Windows catagory or click on one of the brands above.